Sen. Tom Cotton (R., Ark.) on Wednesday condemned U.S. airlines for caving to demands by the Chinese government that the companies remove references to Taiwan from their websites. 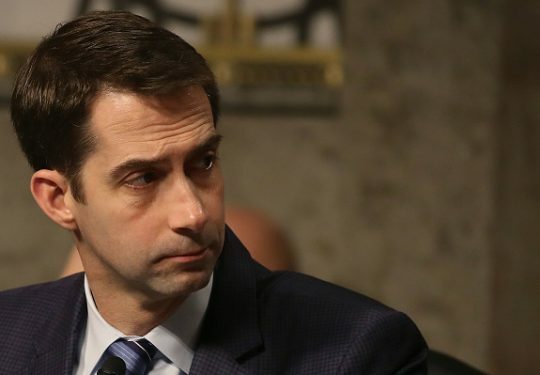 "It's disappointing that American Airlines, Delta, and United complied with this ultimatum, but the Chinese Communist Party's obsession with Taiwan—the only democracy on Chinese soil—is pathetic," Cotton said in a statement. "These demands are the mark of insecure, impotent leaders who know the future will not belong to them." Beijing issued a July 25 deadline for foreign-based carriers to recognize Taiwan as part of China on their online maps and drop-down menus or face steep penalties. U.S. carriers American Airlines, Delta, and United on Wednesday joined foreign companies in scrubbing Taiwan from its booking sites, but stopped short of referring to the island as "Taiwan, China." The three U.S. airlines had requested an extension to comply with the demands while they consulted with the Trump administration, which called the ultimatum "Orwellian nonsense." China rejected a White House request for talks over how the carriers refer to Taiwan. American previously listed Taipei, the capital of Taiwan, as "TPE, Taiwan" on its catalogue of destinations, but changed it to read "TPE – Taoyuan International," referring to the city's main airport, the Wall Street Journal reported. Delta also dropped any reference to Taiwan, listing the destination as "TPE Taipei," with a hanging comma. United changed its site to read "Taipei (TPE – Taoyuan)." "Like other carriers, American is implementing changes to address China's request. Air travel is global business, and we abide by the rules in countries where we operate," an American spokesperson said in a statement. Foreign carriers, including British Airways and Air Canada, edited their websites last month to list Taiwan as Chinese territory. Taiwan's Foreign Ministry called Beijing's pressure campaign "an affront to rules-based order." "Taiwan is Taiwan. It does not fall under the jurisdiction of China's government," the ministry said in a statement. "Taiwan's government calls on all like-minded nations to work closely with it to curb China's bullying in the international arena and prevent China's interference in the business practices of other countries from becoming an accepted norm." Geng Shuang, a spokesman for China's Ministry of Foreign Affairs, called the airline changes a "positive development."